President Wollman seen here during last semester’s commencement, announced she will resign in 2016. 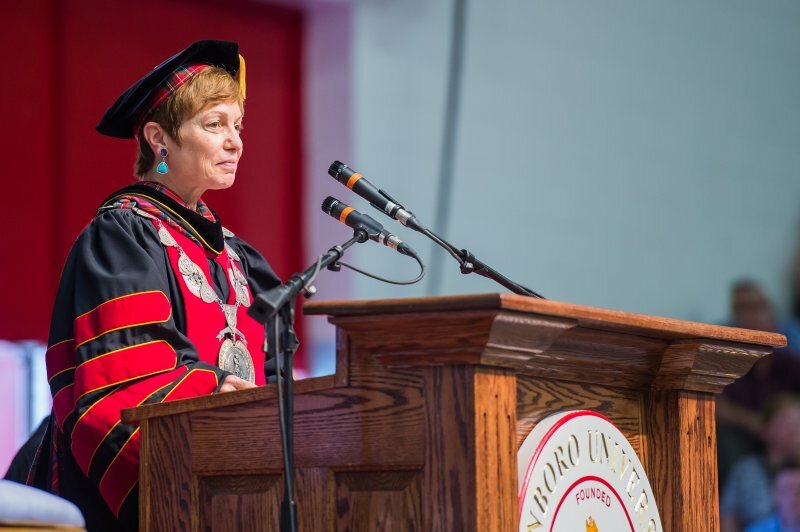 Last week, University President Julie Wollman announced her resignation from Edinboro University. She added the fact that the university has been named a “Great College to Work For” two years in a row, to which she is proud of, as well as the Higher Education Excellence and Diversity award two years in a row. She also added the establishment of Porreco College and its success is a major accomplishment, as well. Looking further back, Edinboro University has had 4 presidents in 20 years. Dr. Frank G. Pogue served 11 years from 1996 to 2007. Dr. Jeremy D. Brown served four years from 2007 to 2011. Dr. James D. Moran served as interim president for one and a half years from 2011 to 2012. Dr. Julie E. Wollman became the 17th president, as well as the first female president, and served over three years from 2012 to 2016. With a change of many presidents, the question of stability comes to mind. “Well, I think the stability comes in consistency of focus. When I got here, there had been a president previously and then a interim president one year and Dr. Brown had not been here for that long, but the focus of what he was trying to do to improve the quality of what was happening here and to raise the reputation of the university, I think that we have carried that on and I think that that’s going to carry on with the new leadership here,” Wollman said. University Director of Communications, Jeff Hileman added there will be a search committee comprised of the campus community and wider community that will determine what exactly the university needs and the kind of person needed to move forward. He added that Wollman’s leadership will continue on and hopes to find a new president who desires openness to the campus and community. And while Hileman stated that it wasn’t up to him to determine what is needed in the next president, he reflected on some of Wollman’s outstanding qualities. “I think that her openness to students is a model that I hope will continue. Her emphasis on putting students first for all of us, even for people who work on campus in roles that don’t directly affect students, I think that she has made them more aware of how they are here for the students and the students are first. I think that’s a very important quality in the university president,” Hileman said. President Wollman appeared saddened by the sudden move, but a smile was on her face when she talked about some of her fondest memories at Edinboro. “Time with students. Having students at our home. Being honorary captain for different athletic teams. Attending student senior concerts. Other events on campus. My listening hours where students have come and really honestly said things that concerned them and I was able to do something about it. The great thing is if you listen, you can do something about it. If you don’t know about problems, you can’t do anything,” Wollman said. “I just really hope that it is clear to the university community that Wollman did an excellent job and she is going to be greatly missed, but we are in a great position to move forward and we will be moving forward in a very positive way,” Hileman said.